There is such a lot of construction going on in the city at the moment and suddenly buildings seem to be taking shape beyond just being a building site. Axeltorv 2 is one of these. It seems that there was a big pit in this location for a long time and now you can see the new towers on the site from well outside the city. My thoughts on the number of high buildings now springing up in the city are for another time. 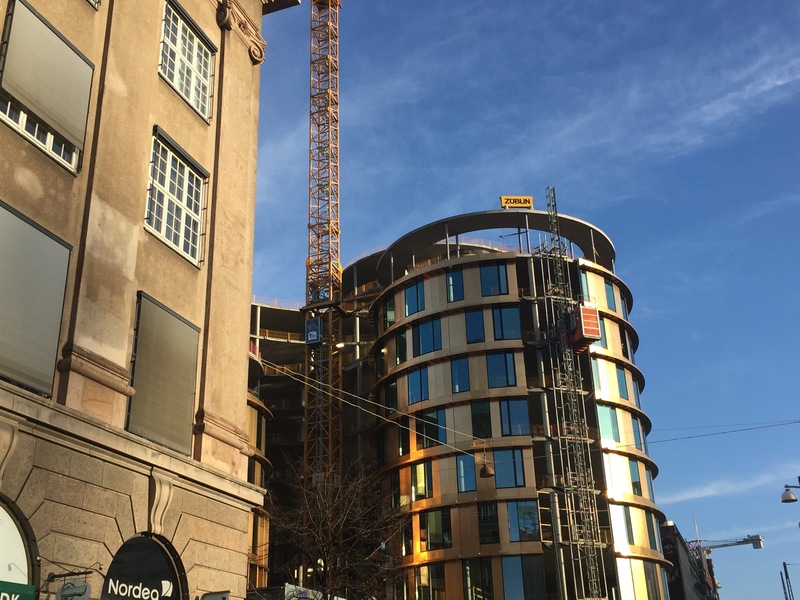 The location of the new construction on Axeltorv seems to have been a long time coming, the demolition of the Scala building formerly on the site began in 2012. This location has a chequered history and is seems somewhat jinxed. The original Scala was a theatre built in 1864 and between 1912 and 1927 was the location for popular revue theatre productions. It was closed in 1930 and renovated but never regained any real popularity and finally closed in 1957. 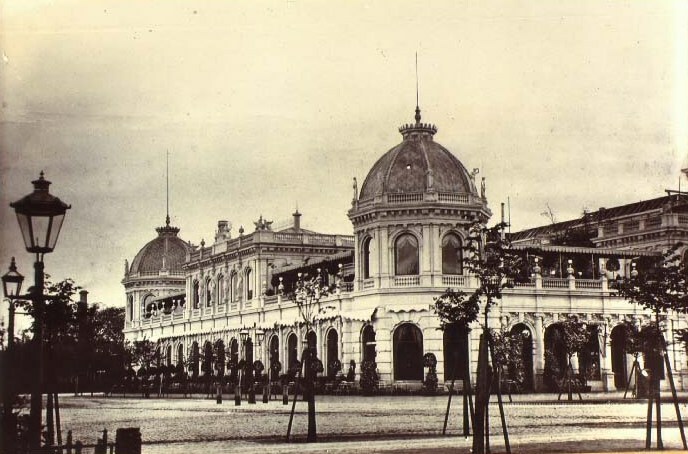 The original building (above in 1882) was demolished and replaced by a department store which was reopened in the 1980s as a shopping mall with entertainments such as a cinema and casino. By the time we moved here in 2008, this had been closed for a year due to lack of success and another demolition was on the cards. I find this history quite fascinating – that a large venue in such as prime spot opposite Tivoli could keep failing so spectacularly. 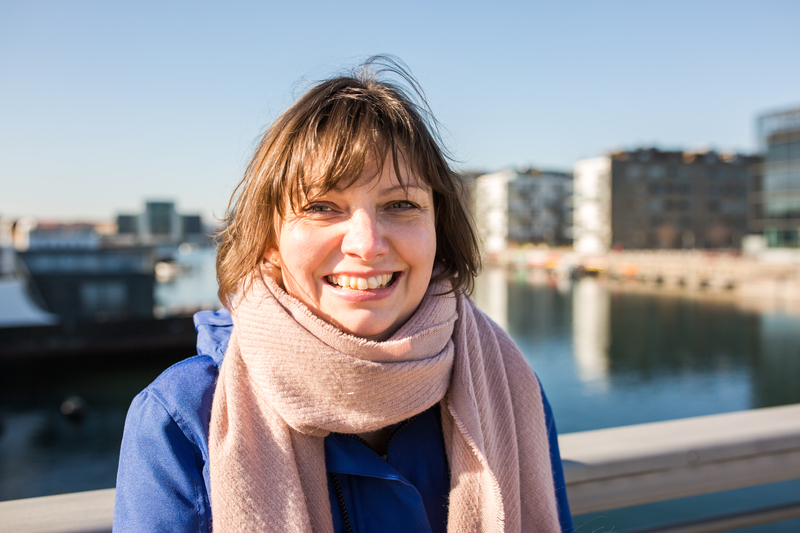 There were many proposals for the new building on the site and in 2016 the new Axeltorv 2 from architects, Lundgaard & Tranberg, will be inaugurated. A couple of the towers appear to be very near basic external completion with the addition of shiny facades . The plans are for five independent towers of varying heights, each connected by skywalks with an open public area or urban garden around the base of the towers. The entire complex will sit separate from surrounding buildings so it can be reached from all sides. The architects say the design is reminiscent of the old city ramparts and will be very environmentally friendly. The complex will house businesses and the ground and first floors will contain ‘high end’ (I quote the architects) shops and restaurants and there are plans for a sky bar or restaurant on the 10th floor of the highest tower. This complex is part of a wider development of this area with Tivoli Hjørnet (Tivoli Corner) coming in 2017. Previous Stop being a smart phone zombie! I was curious about that building, thanks for solving that!! Hehe! I did see it, and I can’t say I am fan of the gold colour…too sparkly, too unusual..